Steve Rogers got his start in the superhero business by fighting Nazi goons and punching out Adolf Hitler during World War II. Today, he is one of the leaders of the Avengers – a team of superheroes charged with battling villains bent on destroying the Earth. You may know him better as Captain America, one of the most popular heroes ever to appear in comic books and one of the main figures in the hugely successful Marvel Comics Cinematic Universe. 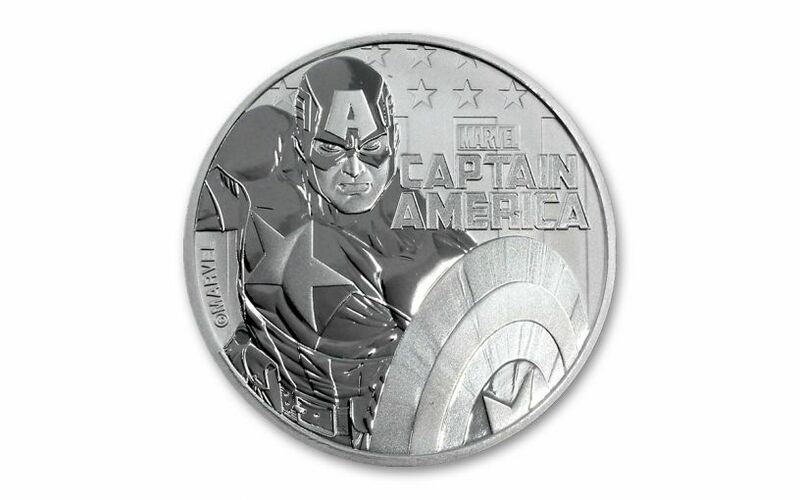 Now Cap gets his time to shine – literally – on this brand-new coin minted in a full ounce of gleaming 99.99% silver! Struck by Australia’s world-renowned Perth Mint on behalf of the island nation of Tuvalu, this one-dollar legal-tender coin is the sixth release in Tuvalu’s popular Marvel Comics Bullion Series, joining Spider-Man, Thor, Black Panther, Iron Man and Deadpool in a line-up of some of the world’s most popular comic book superheroes. Cap’s origin story dates back to the start of World War II when as a gangly malnourished kid, Steve Rogers was rejected for military service only to be accepted into the U.S. Army’s top-secret Super-Soldier project. Injected with the Super-Soldier serum, Rogers was transformed into the peak of human perfection with super strength, agility, stamina and healing powers. Combined with his superior intelligence and leadership skills, Rogers became Captain America, the embodiment of the American spirit. He disappeared after a mission late in the war only to be discovered decades later frozen in a block of ice. Revived, Cap has brought the principles of the Greatest Generation to the modern world where his values and Boy Scout ideals sometimes seem out of place. Armed with his shield made from indestructible vibranium, Cap battles a rogues’ gallery of foes that includes the Red Skull, Baron Zemo, Hydra and even the biggest bad guy of all, Thanos, the Mad Titan. Captain America has thrilled fans of all ages with nearly 80 years of exciting adventures since his first appearance in the pages of Captain America Comics #1 in March 1941. With the film Avengers: Endgame set to launch in theaters this spring – in which Cap, played by Chris Evans, will team with the Avengers in a final attempt to finally thwart Thanos – his popularity will be at an all-time high. Thanks to the success of the films and comics, you can bet fans and silver stackers alike around the world will be eager to scoop up these coins. With only 50,000 struck for worldwide release, the time to order your coin is now while you still can! SIXTH RELEASE IN MARVEL BULLION SERIES – This coin is the sixth release in Tuvalu’s Marvel Comics Bullion Series, joining Spider-Man, Thor, Black Panther, Iron Man and Deadpool in a line-up of some of the world’s most popular comic book superheroes. Captain America is depicted on the coin’s reverse along with his ever-present shield while the coin’s obverse features Queen Elizabeth II. 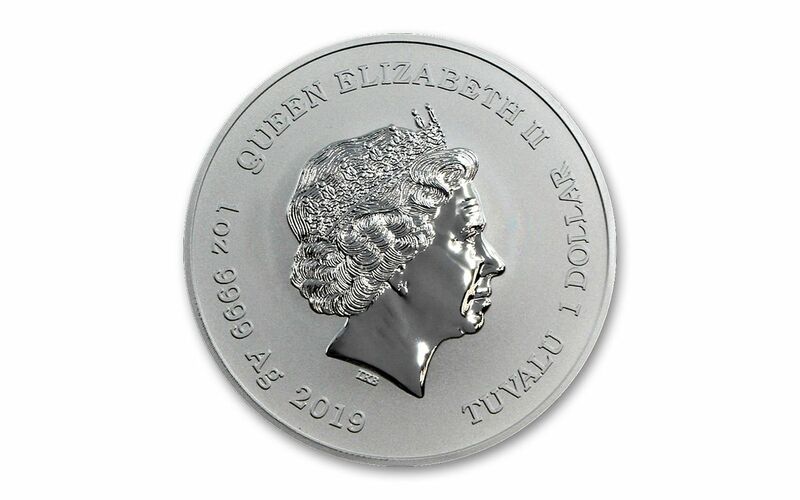 STRUCK IN HIGHLY-PURE SILVER – Each 2019 Tuvalu Captain America Silver Coin was struck at Australia’s world-renowned Perth Mint in one ounce of highly-pure 99.99% silver. LEGAL TENDER COINS – These 2019 Tuvalu Captain America One-Ounce Silver Coins are one dollar legal tender in Tuvalu, a Polynesian island country in the Pacific Ocean located halfway between Australia and Hawaii. The United States used Tuvalu as a military base during World War II. OFFICIALLY LICENSED BY MARVEL – This 2019 Captain America Bullion Coin is an officially licensed Marvel release – and you don't have to look far to know for sure! Both the Marvel logo and copyright are firmly struck into each coin. GLEAMING BRILLIANT UNCIRCULATED CONDITION – Your 2019 Tuvalu Captain America One-Ounce Silver Coin will come in gleaming Brilliant Uncirculated (BU) condition, as fresh and crisp as the day it left the mint. LOW WORLDWIDE EDITION LIMIT – The worldwide limited edition for these coins has been set at just 50,000. Collectors couldn't get enough of the previous Marvel bullion coins from the Perth Mint, and we're expecting Captain America’s army of loyal followers to have these targeted for their collections. Whether you're continuing your collection or just starting out; a massive Marvel maniac or a silver stacker looking to bring some action-packed excitement to your bullion, this 2019 Captain America Bullion Coin is one not to miss!